For fast sight improvement it is vitally important to guarantee delivery of nutrients to the each organ of the body and to the eyes in particular. Every day human body regenerates 300 million new cells. They need vitamins, minerals and microelements as a building material. What is the fastest way to provide it? What is the best diet? Do you know that food can be your the most trusted doctor and medicine? Many people around the globe hilled themselves using Separation diet of American physician Dr. Howard Hay. Dr. Hay contacted near death Nephritis, and began eating only simple natural unprocessed foods, and it improved his health. Dr. Hay then developed the idea of separately eating food from three food groups, corresponding to different pH values, or different levels of acidity. These groups are alkaline, acidic and neutral foods. Neutral or live foods are: raw greens, fruits, vegetables, seeds, nuts and non- pasteurized honey. The whole idea of this Dr. Hay way to cure the body with food is explained in The Secret of Eyes video program. It is great way to start paying attention to what you eat and choose food using ration view point. Live foods , according to the latest scientific research and experience of many key figures throughout history, from Pythagoras and Leonardo da Vinci to Bernard Shaw and Mahatma Gandhi is the best diet for ultimate health. The subject of food is extremely important for ultimate health, however with development of civilization humans switched from native raw food to processed, or cooked food. The Raw Food movement is gaining worldwide popularity, and more and more intelligent people go back to the raw diet. What makes raw or live food the best for humans. The raw foods have all nutrition that our live body needs for ideal existence. Why do fruits left on the table continue to ripen? Because they are still living! Why a roasted seeds will not grow if planted? Because they are dead. Raw foods contein enzymess – amylases, proteases, lipases, about 5000 different kinds. Enzymes are large biological molecules responsible for the thousands of processes that sustain life like metabolism, digestion of food and synthesis of DNA. All raw foods have proper types of enzymes necessary to digest itself in nature. Enzymes are living substances, they cannot tolerate the high temperatures used in cooking, baking, microwaving, canning, and pasteurizing . Heat of 118˚F or higher destroys the enzymes and turn them into harmful to the body substances. Think about it! According to the nutritional research of the Max Planck Institute, most amino acids are irresversibly damaged when heated to standard cooking temperatures. We know that big animals like elephant eat vegetatable protein to build their flesh. For example, the diet of a Gorilla, which is 10 times stronger than man, mainly consits of young leaves, fruits, nuts, flowers, sprouts and roots. What is the basic difference between live and dead food? We live in a chemically-oriented society. 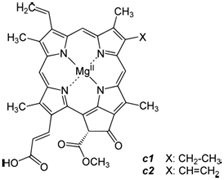 Chemical – a substance with a distinct molecular composition that is produced by chemical process and defined as inorganic. They fundamentally differ from organic compounds. Organic, defined as containing a vital force, which only found in living things and identified as enzymes. Raw or living foods have enzymes, which are critical in building proteins and regenerating the body and high in atioxidants, which help to slow down signs of agin. Heating foods kills live enzymes, ruin itioxidants and leave toxins behind. We have to realize that heating is a chemical process turning food to chemical substance. Thoughout evolution, Homo Sapiens as a species had been eating only raw foods and our digestive system was developed on diet of raw food which naturaly contains live enzymes. Human body can’t handle a diet of mostly cooked food – It causes to fall ill more often and age faster. The absence of enzymes in processed food causes digestive disorders and underlies all other health problems throughout life. Low levels of enzymes are found in those who have diabetes, heart diseases, cancer and most every degenerative disease including glaucoma and cataracts. Big category of processed food are animal based, particularly meat, is double trouble to body because the human Gastrointestial Tract is not designed to properly digest animal-based products. First, the human stomach produces much less hydrochloric acid than in meat-eaters like predators. Also, lenth of digestive system in humans is 3 times longer than in predators, food stays inside the human intestine 24-72 hours, and at high body temperatures can result in the food decomposing and becoming very toxic. Multiple studies prove that animal protein appears to greatly contribute to diseases of nearly every type; and a plant-based diet is not only good for our health, but is also curative of most serious diseases we face. Also, consider that preditors do not eat cooked or prsesrved meat – their food is raw, with live enzymes – and they cure themselves by eating weeds: living green grass. When humans don’t abuse of meat, they live very long lives! Unprocessed, plant-based proteins are much more beneficial for us than animal-based. Proteins – basically amino acids – are found in most vegetables. A cup brocolli or spinach contains, for example, enough amino acids to meet the body’s entire daily need. All poisonous comounds of processed foods, particularly sodas, coffee, alcoholc beverages, sugar, all medications, which all are essentially toxins, and many chemical components added during processing accumulate in the body as poisonous wastes over the years, and detoriorate the functionality of each organ and part of the body, including the eyes. ; also cause biological diseases, bring to depressed state, consequently, lowers the cognitive abilities and IQ and condition the general degradation. We have to stop and reverse it with the simplest solution – Raw Food! Humans have existed on this planet for around 5 million years, and the diet of all our ansestors was based on gathering and occasional hunting of small animals. We are not birds to digest grains; not preditors that kill, tear to pieces and eat animals. Our digestive system is very tender, we basically are raw greens, fruits and vegetables eaters. For eras the climate in Northen Hemisphere was subtropical and humans enjoyed an abandace of vegetation and fruits. Around 12,500 years ago some planetary cataclysm caused a rapid change bringing up very cold glacial climate. This was then followed by the next catastrophe, described in the legends of many cultures as The Great Flood, which wiped out many forms of life, and changed conditions on the planet dramatically. We only have the ruins of giant structures of old civilizations left, and records of Shumers or Old Egyptians, descibing the very long life span of their people. It is easy to assume that after the cataclysms, in a harsh, cold climate, the lifestyle of survivors changed dramatically..Suffering from a shortage of greens, vegetables and fruits, people began planting grains and domesticating animals to provide food for the cold winter. That started the switch to a whole new diet of eating meat and grains and the development of food preservation techniques. This diet of meat and grains is not native to humans! it opened the door to chronic diseases, early aging, and shortened our lifespan. All cooked or preserved foods are dead products. We’ve been turned into dead food eaters, to a civilization of scavengers! Consumption of dead foods causes progressive degeration of the human body and sets up early deaths. No wonder that cancer and other major dieases get younger with each new generation, and the whole planet is turning to an empire of giant hospitals. The closest species to humans are chimpanzees. We share 99% identical DNA, so our diet should be similar. The chimpanzee diet mainly consists of green leaves, fruits, and nuts. If a chimp were to eat soup, spaghetti or hamburgers with soda – they would get sick right away. We have to switch from dreadfull artificial food back to natural live food before its too late. 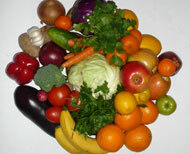 Theconcept of raw food as the only right diet is gainiing worldwide recognition. Even representatives of the medical community, like Dr. Brian Clement, are discovering and acknowledging that the basic cause of poor health is in our food and that live foods are the prime solution to health problems. The human body consists of 1013 to 1014 cells.] There are coincidentally about 1014 atoms in a typical human cell. Our body operates as an amazing universe where everything work in incredible perfect order, cooperates in uncomprehendingly sophisticated way and coexist as one organism. Each cell and the whole body as living structure constantly redesigns and regenerates itself. It needs as a building matter similar living compounds with the same mobile bonds inside – enzymes, which exists only in raw food. So, the idea that human body is just a compound of chemicals couldn’t be more ridiculous. Our scientists probably will never figure out fully how this live universe works. It is impossible to cure the body with medical approach – we have instead more new diseases, growing numbers of sick people and more hospitals. The solution is absolutely simple – switch back to a native diet! Row food has all valuable nutrients to provide better health and helps body to heal itself! This is simple truth of great health and better longevity! Switch to Raw Food, by gradually adding more raw food every day. Make it 80% of your meals and see if you feel like going further. Even if it is not fully organic and might have pesticides and herbicides – with raw foods, the body can regain its natural detoxifying abilities and eliminate much of those chemicals. Living in an industrial, chemically-oriented society, we cannot efford to be ignorant about the foodsthat we eat. Anything packaged in box, jar or can is not just dead food, it is stuffed with very harmful chemical additives – toxic substances. All kinds of processing (baking, frying, boiling, salting, sugaring, souring) are altering the natural structure of live food, converting it to chemical matter and leaving just a few real nutrients. Processed foods recognised by receptors of our body as toxins; they weaken each organ icluding the eyes. So, where is the basic cause of all human diseases? It is in our digestion system, in our conventional food. The body can withstand a small amount of non-raw food, but it shoud be no more than 20% of the whole daily intake. The ideal solution for best health is 100% raw food. Nature created for us the most juicy, most colorful, sweetest and healthy food – let’s use it with appriciations and gratitude! The raw foods are: sprouts which are simplest thing to make with no extra expenses, fruits, vegetables, soaked seeds and nuts, mushrooms, non-pasteurized honey and of cause plenty of filtered water. All processed food – including home cooked food – is not only stripped of live enzymes and vitamins, but also recognized by body when eaten mostly as harmful substances, even if the products were so-called organic (can’t be fully organic were grown on contaminated water and in polluted environment). Also the lack of true nutrients generates the sensation of hunger, but eating more dead food only adds more harmful toxins, leading to overweight and diseases. Besides, cooked food has 2 times more calories than raw! Eating dead food dramatically reduces resistance to viruses and harmful bacteria. It is hard to see how any conscious person, who is a friend to himself, could read this information (there many books and videos about raw foods available as well) wouldn’t quit eating processed food and adhere to a raw, living food diet. Let your living food be your medicine, your best and free medical insurance! 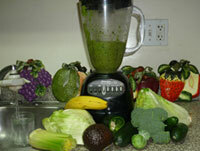 Get a blender, make a coctail of fruits, greens, sprouts, vegetables – anything that you like. Blend it well, and let is be your main meals. Have raw seeds or nuts soaked in water in between. Make your own juice, blending your fruit with filtered water and raw honey, and enjoy a delicious and most healthy drink.The best of the best among raw recipes are coctails of blended dark green leafy vegetables and fruits. Dark green leaves contain the most valuable nutrition: chlorophyll. Look at the icredible similarity of the molecules of Chlorophyll in plants and Heloglobin in humans!!! Blend your vegetables or fruits and eat it often, soon you will notice that you have no craving for processed foods, even those which were your favorite! And acknowledge yourself, be proud of doing the best diet, foresee yourself in great shape, getting healthier and younger, with better eyesight! You can start with the Separation Diet or begin Raw Food diet right away (encreasing proportion of raw food gradually) – the choice is yours, but for the sake of your eyes, choose what to eat consciously. Provide the best nutrients for the fastest regeneration of each cell in your body and in your eyes in particular. This will open the door to the fastest sight improvement. Hippocrates, the ancient Greek physician 2,500 years ago said in his precepts: “Let food be your medicine”! Live, not processed food is the greatest answer for ultimate health! Raw food will save you tons of money and help to stay always healthy and fit! Today, doctors dig the structure of the body deeper and deeper, trying to fix the problem, to cure but it is obvious that they simply don’t see the forest for the trees – they do not recognize that natural, raw food is the way to prevent ALL diseases and is an ultimate cure! Or does it seem that they just want to keep their business going? It’s up to their integrity. And, please, spread the news. There so many people suffer from all kinds of health problems and not one of them realize that they only need to change their eating habits, and all diseases will disappear! Get more information in “The Secret of Eyes” Eyesight Improvement Program and restore your vision fast!